(Nanowerk News) A research team led by the University of Pittsburgh's Jeremy Levy has discovered electrons that can "swing dance." This unique electronic behavior can potentially lead to new families of quantum devices. Electron pair generation gap. Bottom row: representation of electrons in a superconducting state. The couples dance synchronously and without energy loss. Top row: electrons dancing completely independently, the non-superconducting state. 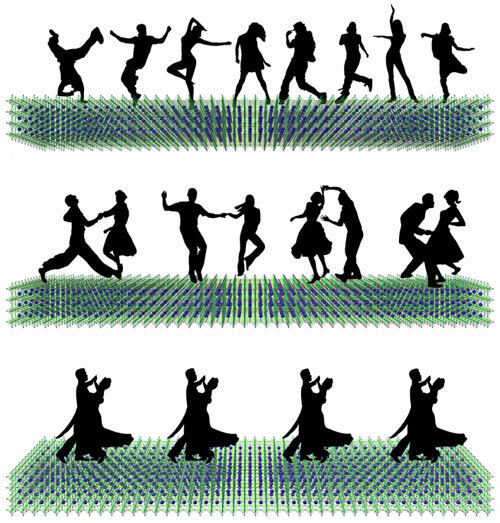 Middle row: electrons “swing dance” as pairs but do not form a superconducting state. Such a breakthrough would radically transform an array of technologies such as high-speed trains, energy-efficient power transmission, and computers that operate with negligible power requirements. The work, done in collaboration with researchers from the University of Wisconsin-Madison and the U.S. Naval Research Laboratory, will be published May 14 in the journal Nature ("Electron pairing without superconductivity"). The first theory to describe how electrons pair without forming a superconducting state was published by David M. Eagles in 1969. Lead author and research assistant professor in the Levy lab, Guanglei Cheng, described how the theory was proven right: "The breakthrough comes from the technological advancement to fabricate superconducting single-electron transistors at an oxide interface--a technology that allows us to count electrons and pairs one by one. And this is just the beginning. We now have a novel platform to study the fascinating electron-electron correlations at nanoscale dimensions."